If you are headed off to the fair, you had better have some extra carrying capacity to bring along. 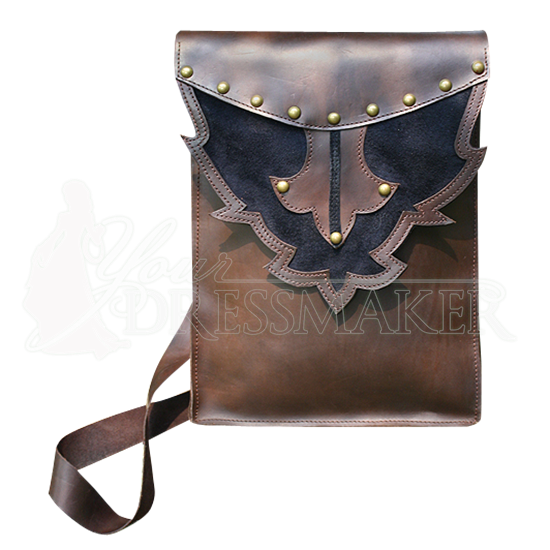 And if you feel like you might need a little help carting away all your extra items, then you might want to consider this Tall Leather Shoulder Bag. This shoulder bag is a handy accent to have, as it can not only enhance your costume, but it can also help you out by making it easier for you to shoulder all your extra burdens while you are at the ren fair. This bag is crafted entirely out of 100% real leather, giving it a handsome look, while it also features touches of design that really accent its appearance. The bag is offered in two colors, either dark brown or black, and each one features accents of the other color (meaning if you get a black back, you get dark brown accents, and vice-versa if you get a dark brown bag). It also features brass studs for decoration along the flap closure, as well as a hardy shoulder strap that makes carrying this bag that much easier. It stands approximately 13.5 inches tall from the base and measures 10 inches wide, which ensures that it has quite the carrying capacity. You can fill it with snacks, modern amenities, books, trinkets, and more when you hit the fairgrounds, and when fair season is over, you can make this Tall Leather Shoulder Bag do double-duty by putting it to use in your daily life, too.